In a crowded games market where it may be tough to stand out, games that try to meld genres tend to have the greatest chance of getting attention. Of course, the problem with that technique is the simple fact that it can be hard to make an engaging game takes the right elements from their respective genres. As a reverse TD Action/Strategy hybrid Demonrock: War of Ages ($0.99) actually does a decent job from a technical standpoint in melding gameplay. However, it’s missing a lot of the refinement from each of those respected genres that make them popular. 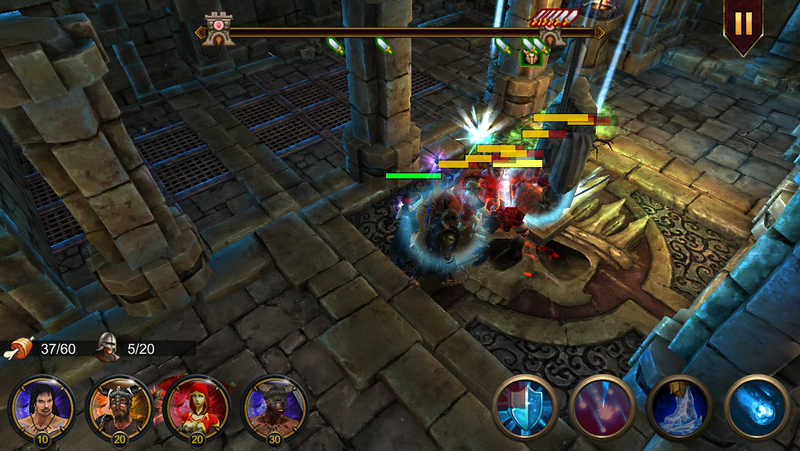 Dubbed a ‘Reverse Tower Defense’ title by the developers, Demonrock doesn’t neatly fit into that description. True, you launch monsters towards an enemy base with the intent to take it out, but players don’t have the option of customizing or choosing paths to send them down. You also aren’t going against static towers; the computer sends mobs back at you as well. In addition, the 3D 3rd-person camera angles prevent you from looking at the whole map, diminishing some of the potential strategy. Finally, while sending mobs is a key aspect, players will spend most of their time controlling their hero. While I found the gameplay pretty basic, I enjoyed the combination of simultaneously controlling my hero and launching mobs. Speaking of heroes, players have a choice between two heroes with an additional duo available via IAP. While each hero has different fighting styles and special moves, all have three active abilities along with one passive trait. The camera also exclusively follows your hero around, making your mobs almost a secondary element as you position your hero for the best vantage point for attack. A simple, linear equipment upgrade path (complete with minor visual changes) provides opportunity to boost stats, but stats themselves are highly simplified and limited primarily to damage and health. There’s enough in terms of hero variety and upgrade opportunities to keep you playing, but it’s pretty barebones. I was also a bit disappointed in the fact that the more interesting heroes were locked behind IAP. Speaking of barebones, the same could be said for Demonrock’s overall gameplay. There’s no where near as much strategy as a traditional tower defense title, with a lot of the tactical consideration restricted to which mobs to take into battle and in which order you let them loose with the resources provided. Such strategy doesn’t matter much, however, as once you find a combination that works, it’ll net you a win in nearly every single level. I also found the difficulty pretty nonexistent for some heroes, a sign of potential issues with gameplay balance. Being a hero oriented title, you’d expect some pretty crisp control options for guiding your avatar of destruction. Alas, this is probably Demonrock’s greatest weakness. I found the tap controls a bit erratic, with very tight windows for the tap-to-move system and found it occasionally difficult to tap on an approaching enemy to aim (the game tended to treat the taps as movement commands, putting my ranged heroes in harm’s way). Pathing is also an issue, as tapping on an area to move your hero too has a tendency to have them to take the long way to that location. Meanwhile, ally mobs like to get stuck behind your hero impeding their progress. I’m not sure if this is a deliberate feature of the game, but I found it annoying nonetheless. 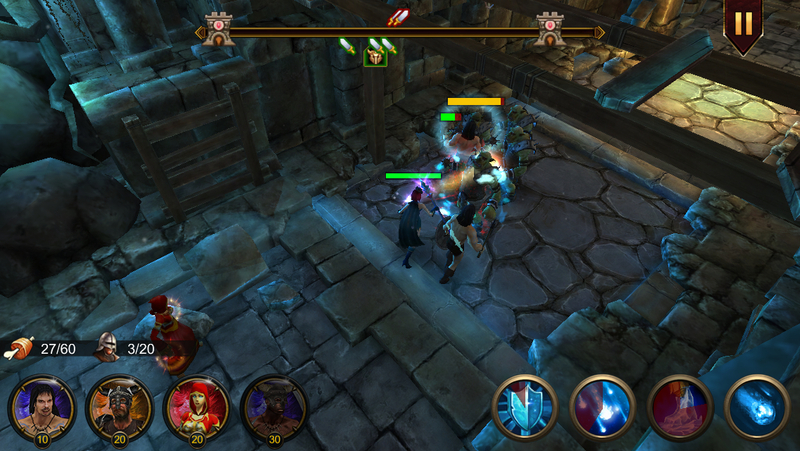 As I mentioned earlier, I’m a fan of the ‘reverse tower defense’ gameplay that Demonrock brings to the table. It’s simple, but works pretty well in most regards. However, the issues with the controls combined with the limited amount of content (such as heavily reused arenas and enemies) really hold back Demonrock’s potential. It’s certainly worth a shot if you’re interested, but keep your expectations in check.